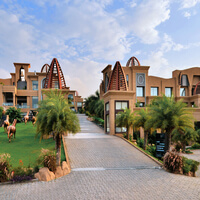 Some of the property types that Pune has are service apartments, resorts, and boutique hotels. These properties are full of amenities. Common amenities you will find in these properties are 24 Hour Checkin, Restaurant, and Business Center. Top properties in Pune are present in the famous localities of Kalyani Nagar, Baner, and Pune Railway Station. It is easy to reach these properties as they are located around the popular landmarks like pune mahanagar parivahan mahamandal limited, sinhagad fort, and sahyadri hospital. So, for a pleasurable experience, plan your trip to Pune only with Cleartrip. You may also check out to reach the nearest airport, pune airport or station, Pune Junction railway station by booking your journey via Cleartrip.